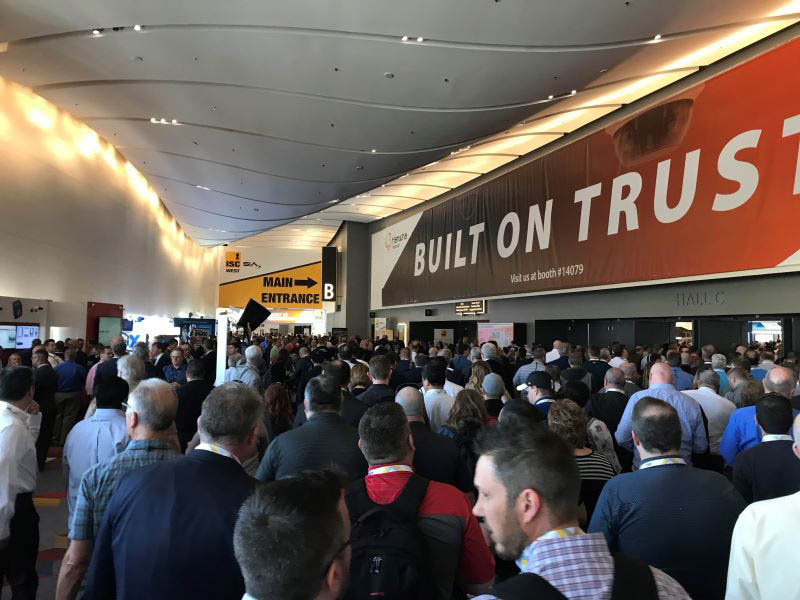 Every year 30,000+ Security Geeks (oops...Gurus) attend the biggest security expo in North America - ISCWest. Charge! 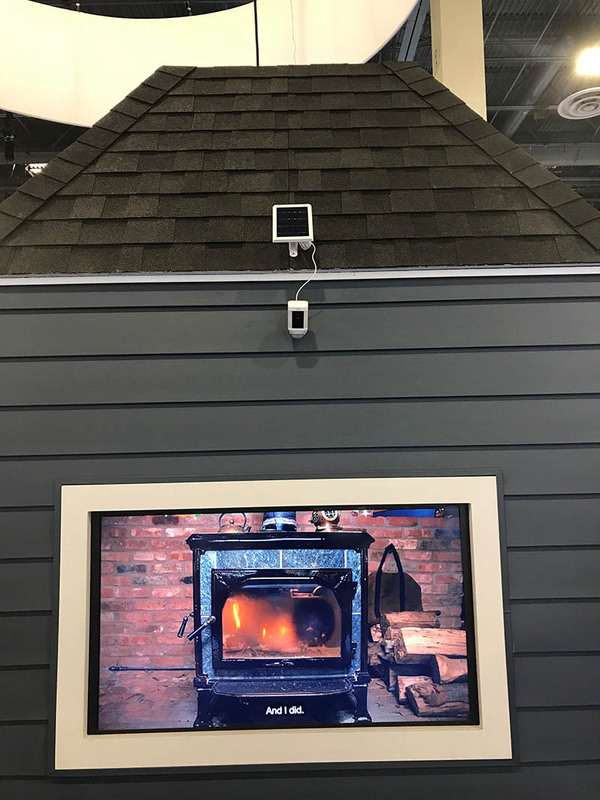 We connected with suppliers to negotiate the best pricing and brought the latest smart home and smart business technology back for our Clients and Dealers. Would you rather deal with the Dinosaurs that never change or the People that believe in Innovation? 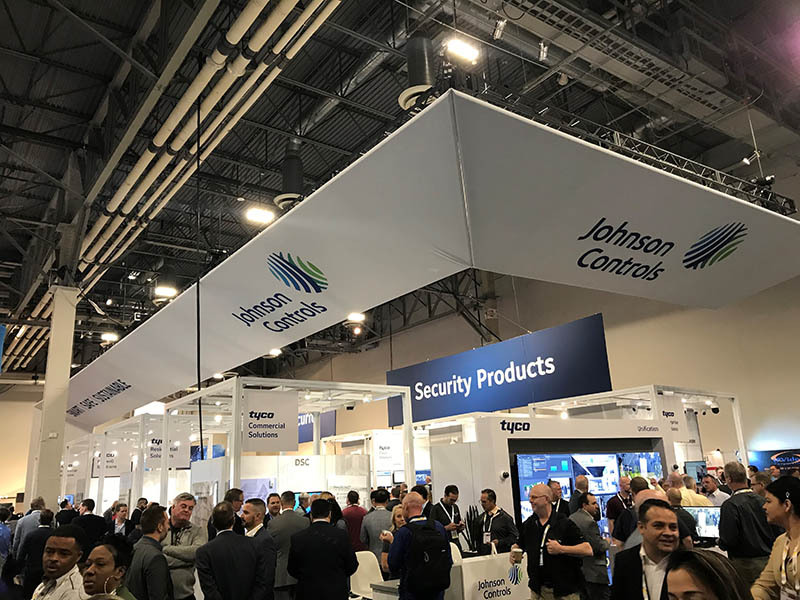 Our partner Johnson Controls had a very busy booth. Product lines that we professionally install include DSC, Qolsys, American Dynamics, Exacq and Kantech. The biggest advantages of using these sister product lines are integration and one app to control your security solutions. True convenience! COMING SOON: Reed Security has been approved to become a Kantech Entrapass Global Dealer. 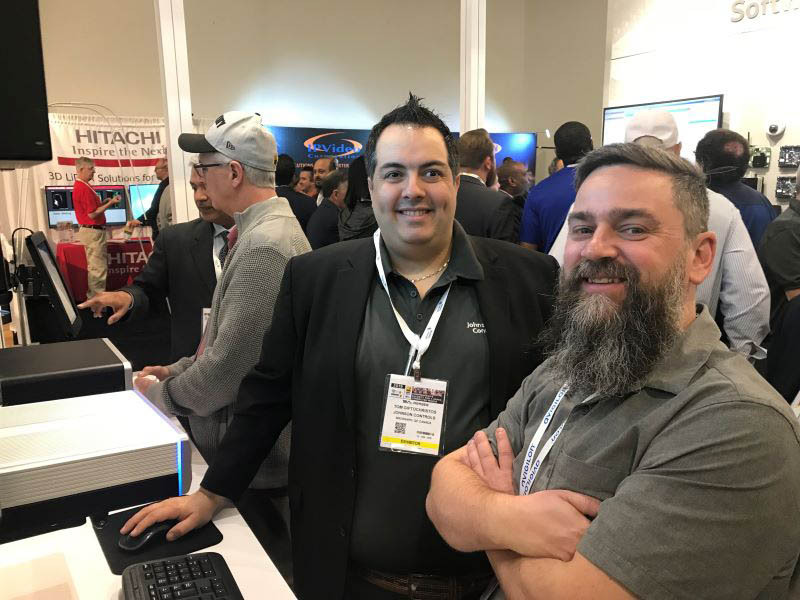 Senior Account Executive, Geoff Assman (right), connected with Kantech Field Application Specialist, Tom Giftochristos, to review the new features in Kantech EntraPass v8.0 including mobile app enhancements and a redesigned web interface. NEW: Reed Security now offers Kantech Hattrix cloud-based access control. No server or up front software costs + no backups required. Conveniently manage your locations from your smartphone or desktop. Requires high-speed internet at the secured premises. Contact us for pricing details. Automatic Systems has a fence barrier solution that ties into keyless entry systems. Restrict traffic in and out of your compound. Check out the video. 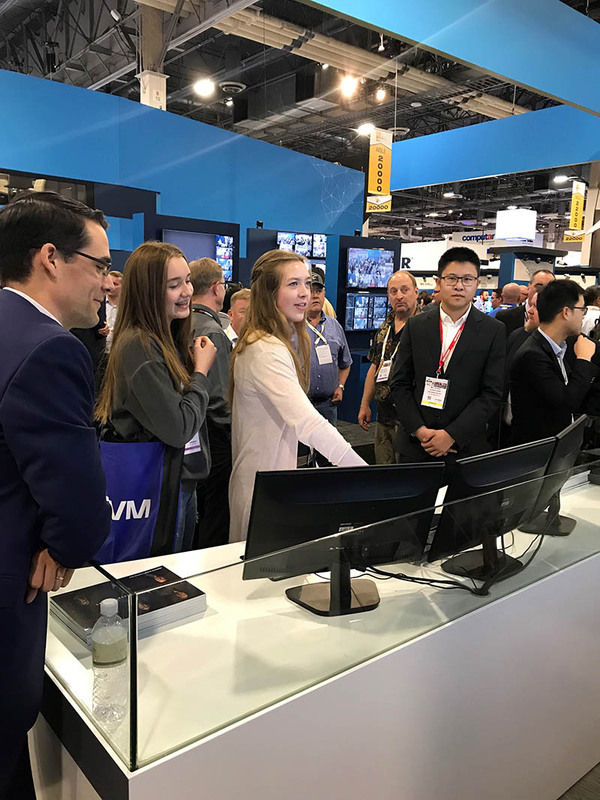 We visited our partner HIKvision with our Brand Ambassadors, Rain and Meadow. What's more fun than demoing HIKCentral Management software on four 65" screens? 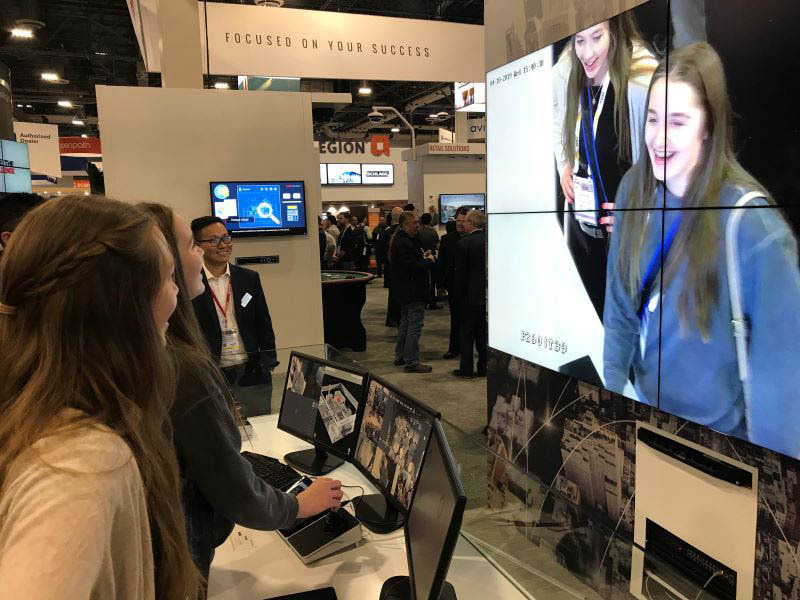 HikCentral is a video business intelligence solution that provides features such as facial recognition, face matching and searching and people counting. Businesses can improve efficiencies and reduce costs. Using deep learning technology, AcuSense detects humans and vehicles and filters out unwanted false alarms. When a human or vehicle is detected a strobe light and audible alarm are triggered - a huge deterrence for unwanted visitors. Instant alerts can also be sent to your smartphone. All objects with a temperature above absolute zero emit thermal radiation, even at low levels. This kind of radiation, invisible to the human eye, can be detected by thermal imaging sensors. 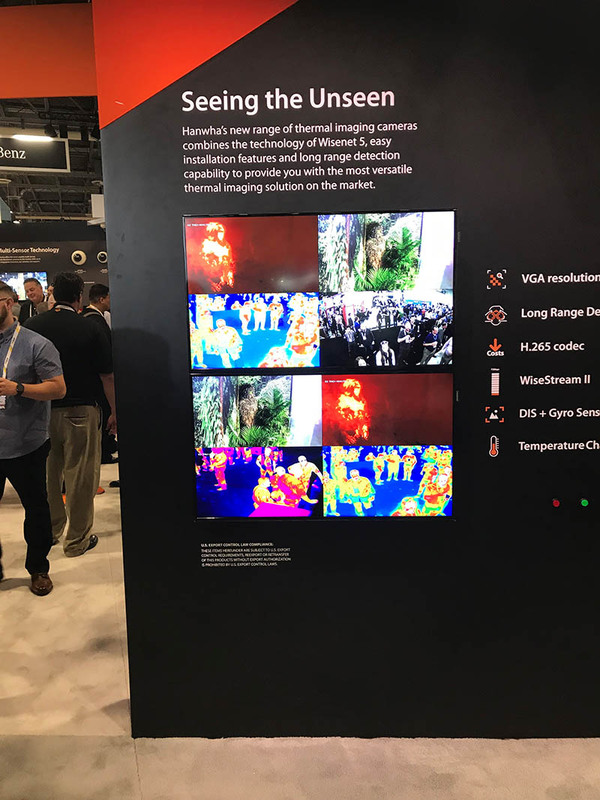 Thermal Cameras can produce images in the visual spectrum by detecting temperature differences between an object and its surroundings. The larger the difference, the bigger the contrast variety, making details visible. Thermal cameras can be used for applications in more challenging environments to detect people and fire. 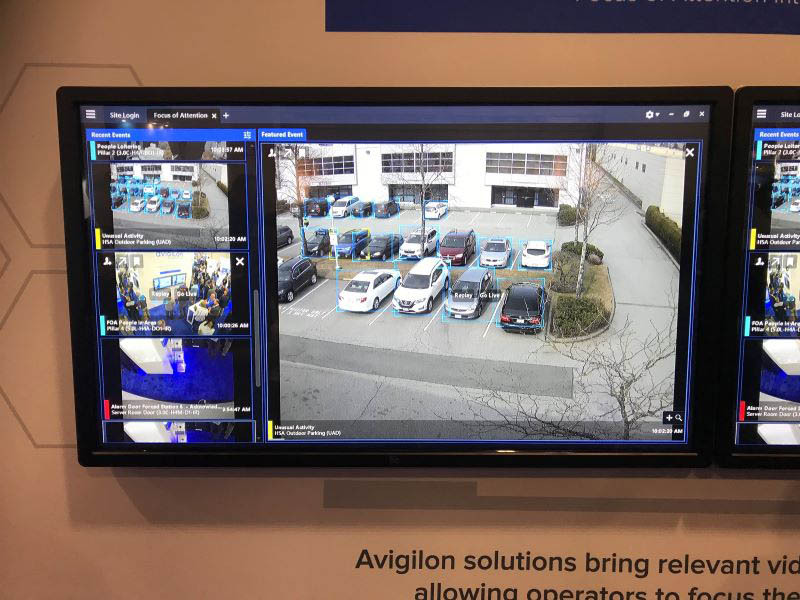 Our partner Avigilon released ACC 7 video management software featuring Focus of Attention, a cutting-edge user interface for live video monitoring. It uses AI-powered self-learning analytics and Unusual Motion Detection technologies to help ensure critical events don't go unnoticed. Alarm.com's video analytics engine provides an intelligent new layer of security and awareness for home and business owners. Object classification and object tracking technology can distinguish between People, Vehicles and Animals, determine an object's direction of movement, and measure the duration of activity. Alarm.com subscribers can selectively control and manage notifications and assign virtual zones and multi-directional "tripwires" so they can monitor their properties for highly specific activity. *Vehicles coming and going: Know when a vehicle stops outside your home during the daytime, or if a vehicle leaves unexpectedly overnight. *Lingering Visitors: Get a video alert if someone lingers by your front door, but not when the mail is delivered. *Pet Protection: Know which neighbor's dog has been visiting your lawn. Know immediately if your own pet bends the rules and naps on the couch when you're at work. *Automated Deterrence: Set your lights and other home automation scenes to turn on when a person enters your backyard, but not when an animal enters. *Vendor Validation: Business managers can confirm that a delivery truck pulled into the loading dock, but won't be notified each time a customer exits the building. 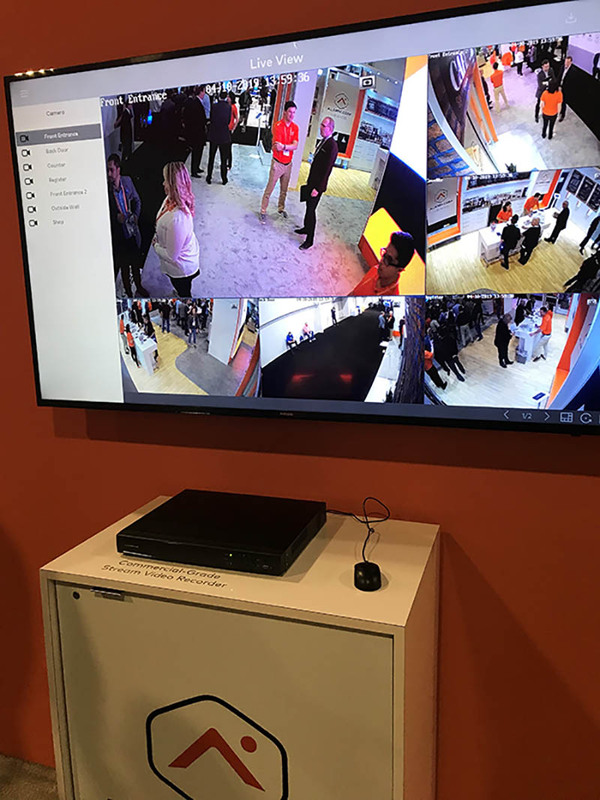 NOW AVAILABLE: Video analytics now work with ADC-V522IR indoor wi-fi camera, ADC-722W wi-fi bullet camera, ADC-VC726 poe mini bullet camera, ADC-VC736 poe bullet camera, ADC-VC826 poe dome camera and ADC-VC836 poe turret camera. Requires a video analytics plan subscription. 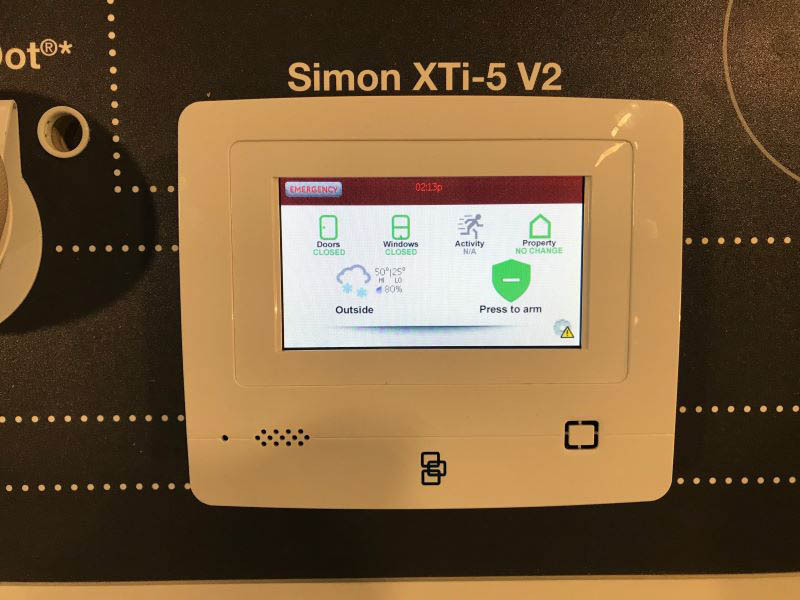 SHIPPING SOON: Interlogix Simon XTi5i has a an updated display that matches with the Alarm.com app. Now supports 80 wireless zones. Ring.com displays a solar powered security camera. Perfect where no power is available. Not available for sale yet on their web site. The smartest security and automation on the block goes commercial. Our partner Qolsys now has a UL 1610 Certification for Commercial Burglar detection. This cutting-edge system is the perfect solution for small businesses! Features include: 7" HD touchscreen, up to four partitions, screen lock, 6-digit passcodes, support for PowerG sensors (industry best range of 1.6km open air), disarm photos and secondary keypads. The 2.3 Commercial software update also enables Alarm.com for Business, the industry’s leading interactive services platform integrating smart business security, access control, smart video monitoring and energy management technology. Our top-rated Alarm.com apps make it easy to manage your smart home or monitor your business with everything connected into a single, intuitive interface. Trusted by millions, the Alarm.com app integrates your security system, connected devices and more into a reliable, easy and smart experience. Control your whole home from a single screen. Whether you’re at work, on vacation or just relaxing in front of the TV, Alarm.com’s mobile app puts your home’s security, access and comfort at your fingertips. Secure your home, dim the lights, view alerts, watch live video and even answer the door with just a few clicks on your mobile device or tablet. 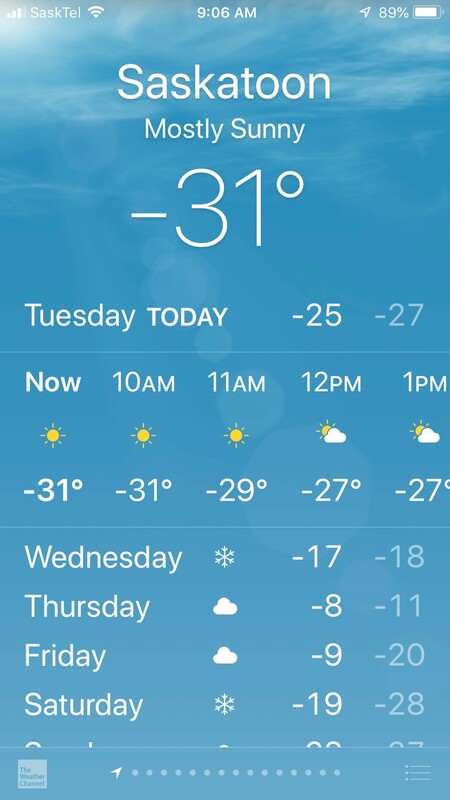 At least it's "Mostly Sunny"
How close have your home's water pipes come to freezing this winter? Not sure? That's understandable—after all, pipes tend to be out of sight and out of mind. Until there's a big freeze, that is. That's when thousands of homeowners find themselves dealing with burst pipes and big cleanup bills. As pipes freeze up, the water inside expands as it turns to ice, splitting the pipe or causing joints to loosen. When the ice melts, the washout begins. Mid-winter is prime-time for this expensive home repair emergency. If you don't shut off your water supply quickly, cleanup costs can cascade into thousands of dollars. 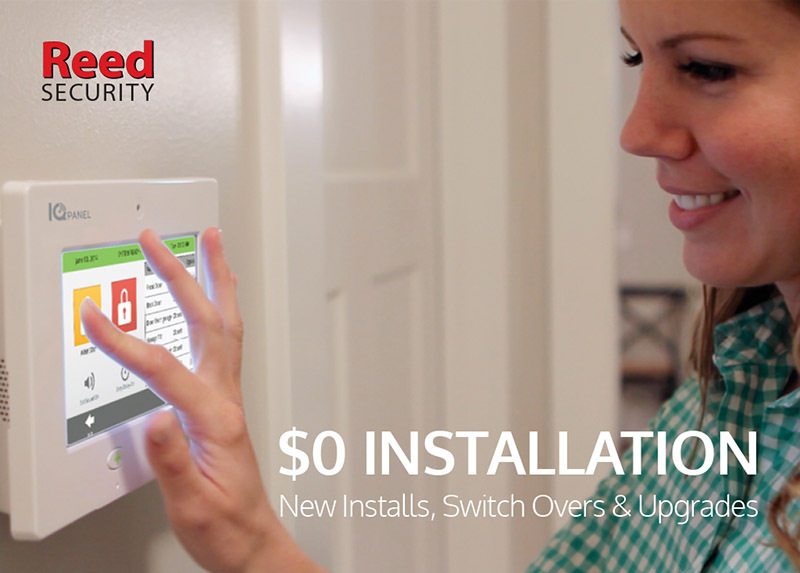 The good news is that Reed Security Smart Home has a number of very smart, proactive safeguards to protect your home and your wallet from water damage. An Alarm.com-powered temperature sensor in your basement or crawlspace can give you early awareness of an imminent winter washout. Connected wirelessly to your Alarm.com smart thermostat, this sensor can give you an instant temperature reading via your Alarm.com app. It can also trigger a smartphone alert if the temperature drops to a dangerous low, giving you advance warning that you need to deploy a space heater or take other emergency measures. If a pipe does freeze and burst, you need to know as quickly as possible. An Alarm.com-powered water sensor is the tool for the job. 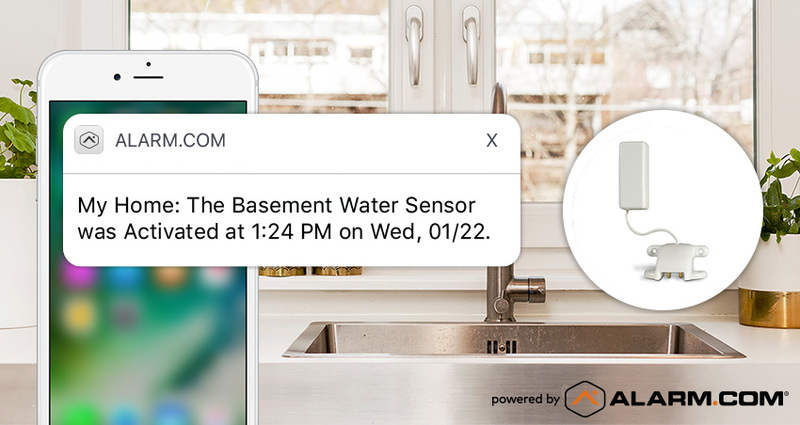 Installed on your basement or crawlspace floor, this sensor triggers a smartphone alert when it detects a leak, enabling you can spring into action and shut off your water supply. If you're far from home, you can use your front door's smart lock to let a trusted neighbor or plumber in to do the job. The smartest solution of all is a proactive safeguard in which Alarm.com can automatically shut off your home's water. When a water sensor detects a leak, Alarm.com's platform triggers a water shutoff valve attached to your water supply, immediately preventing further flooding. If you're away from home often, or own a second home, this is the ideal water defense for your home and your peace of mind. WANT TO PREVENT A WINTER WASHOUT? 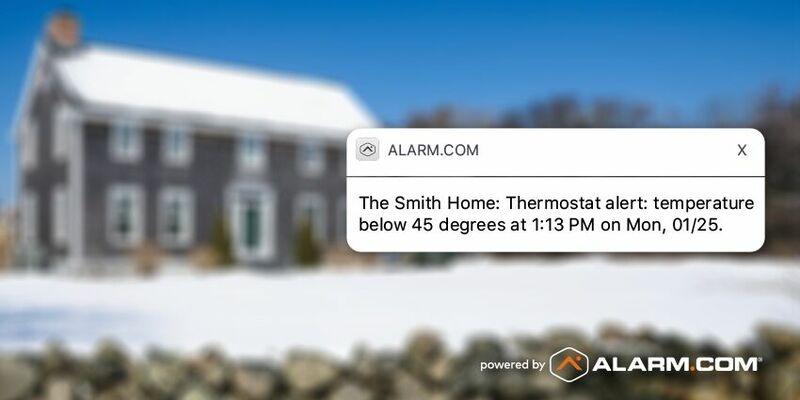 With connected sensors, instant alerts and powerful home automation, Alarm.com is the smartest way to protect your home and family from winter weather and much more. If you're not an Alarm.com-powered homeowner yet, contact Reed Security for a no obligation smart home security evaluation. *If you are already in a contract, early upgrade fees apply. *Not available in all markets. Only available at participating dealers. *Limited Quantities. When we run out of IQ panels we will substitute with XTi-5 panels.